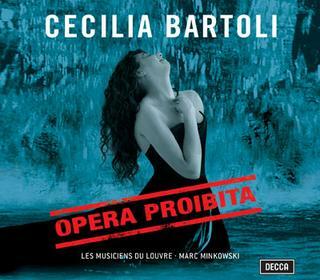 I went mad over Cecilia Bartoli when I first heard her because I had never heard such thrillingly emotional singing. Once again I find my heart racing. My biggest impression during Cecilia's Vivaldi concert years ago was: who knew Vivaldi was this interesting? It was very much more than I could possibly have expected. No one can program a Baroque concert or a Baroque recording better than Cecilia Bartoli. And opera proibita is even better. In 1700-1710 the Baroque was in full swing. What a service to Scarlatti and Caldara to hear this wonderful music, the Baroque at its dynamic peak, full to overflowing with excitement and vigor. I would not wish to slight Handel who is at his most youthful and Italian here. The performing editions for the Scarlatti and Caldara arias are by Cecilia's musicologist friend, Claudio Osele. These are first recordings. Cecilia has used her early success to build an amazing career. She is answering my questions about the composers of Italian Baroque opera in a very personal way. She makes us feel again the brilliance of the Italians. Since the time of the Vivaldi concert I have not been able to fully understand the path Cecilia was taking, but there is a particular passage in Scarlatti's "L'Alta Roma" (an amazingly brilliant aria) when Cecilia is singing with a trumpet where it all came clear. Her time is spent with instrumentalists who specialize in the Baroque and classical eras, and with those who conduct them, and as a result she is playing her voice like an instrument. She matches them note for note in a style and technique of great originality. For once I have no complaints about this original instruments orchestra. The entire album is marvellous. Marc Minkowski, who also conducted the Giulio Cesare in Zurich, is wonderful in this style. Cecilia has worked with a lot of conductors, but this collaboration seems to be raising the level of her performances to a new high. Minkowski inspires her. The thing that separates a Cecilia Bartoli recording from all others is the emotion, and this one is as intense as anything she's ever done. No one can get so much passion into coloratura. The more I listen the more I love it.